Yes, but let’s give the old guy credit for having to work with such primitive tools — like himself. That’s right; I don’t have to calculate or plan anything in my own head like what’s-his-name did. With a single, thunderous click I unleash an awesome whirlwind of mathematical calculations, the simplest of which would leave me frowning and scratching my head. But that’s only one of the reasons I’m better than Escher. Or wait. Actually, that’s the only reason I’m better than Escher — it’s that simple! 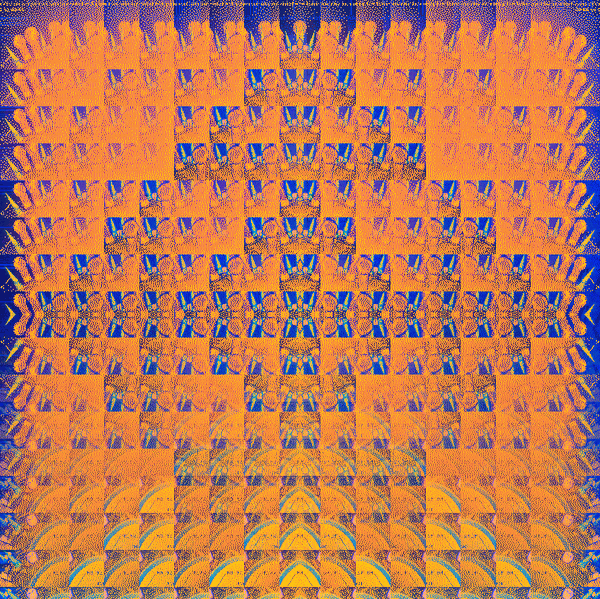 Perhaps there is something from the mind of that Escher guy in one of my photoshop filters? That’s not a bad guess, especially considering how incredibly Escher-like this image is (I made it, not Escher). Declaring myself to be better than him (was he a man or a woman?) is my little way of tipping my hat to him/her. Why then should anyone hold on to works by MC Escher, or look at them, when they’ve got my stuff? Well, lots of reasons. First of all, they make me look good. Escher worked almost entirely in black and white while I work with millions of colors, although I restrain myself (most of the time) by sticking to a 256-color palette to reduce file sizes, and for some other reasons I can’t remember. If Escher was alive today (he isn’t, is he?) he’d want to steal my enchanted tool kit and run out the door with it. But I wouldn’t stop him. In the classic sage-like response to just about everything, I would just roll on the floor laughing. And then download the whole lot once more. Times sure have changed, haven’t they? What would Escher be doing today? He’d probably be writing graphical programs with a mathematical angle (no pun intended) like fractals or 3D; trading his pencils for pixels in an instant. He’d know better than to compete head to head with the likes of someone like me. Smart guy. was he a man or a woman?